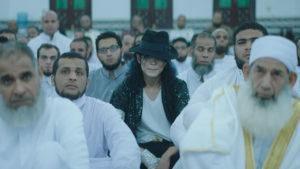 Khaled (Ahmed El-Fishawy) is a respected junior cleric in Alexandria whose seemingly stable life becomes derailed by the news of Michael Jackson’s death in June 2009. Succumbing to long-suppressed feelings of turmoil and anxiety, he begins neglecting his wife and child and slipping up while leading prayers at his mosque. Flashbacks to his teenage years – when he was nicknamed ‘Jackson’ on account of love for the King of Pop – explore the causes for his present unravelling which has much to do with his fraught relationship with his gym-owning, former-bodybuilder father, who cannot comprehend his son’s obsession with the superstar singer.